My favorite pizza crust is the super thin crunchy type. The one where you bite into it and you hear the crunch. So paper thin that you can barely see it, but you can definitely taste it. When I make my pizza crust, I make it in a rustic shape, not a perfect round or rectangular shape. The dough just has to be rolled and stretched to a super thin size. What makes pizza so wonderful is how versatile it is. Everyone can have their own favorite toppings. Just make smaller individual pizzas and everyone is happy! 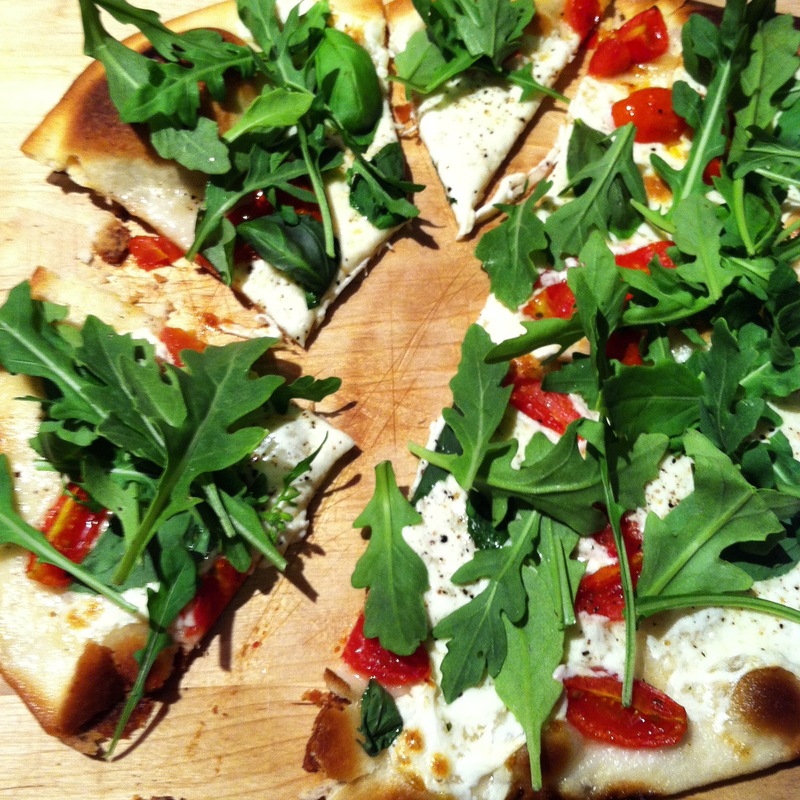 For this pizza, I added my favorite toppings, fresh mozzarella cheese, garlic, olive oil, grape tomatoes, basil and baby arugula. As always, used only organic ingredients. For that added hint of flavor, I marinated the cheese and tomatoes in a herb-ed olive oil mixture I made several hours before. Just added garlic, pinch of salt, pepper, and oregano to the olive oil. Mixed it and added the cheese and cut up grape tomatoes and let them get happy in the oil. For the dough, I highly recommend you use “00” flour. I believe it makes a difference and makes the dough so much more delicate and lighter than using all purpose flour. But, if you cannot find it (although you can order it online or in Italian specialty stores) , then I would suggest you sift the flour first before adding it to the water and yeast mixture. Combine the water and the yeast and stir to incorporate. Allow it to rest for about 15 minutes. It will start to bubble up a little. If you are using a stand up mixer like I did, place the yeast mixture in the large mixing bowl. Use the dough hook attachment. (If mixing by hand, place in a large bowl and gradually add in the flour, mixing well to incorporate until smooth and elastic, about 7 minutes.) Turn on a low speed and gradually add in the flour. You will need to scrape the sides down to incorporate the flour. Mix for about 3 minutes. Remove the dough and place onto a lightly floured surface. Knead the dough for about 5 more minutes. The dough should still feel moist and slightly tacky. If it’s sticking to your hands and counter-top like bubble gum, work in more flour one tablespoon at a time until it is smooth. Place in a bowl and loosely cover with plastic wrap and a tea towel. Allow it to rest for at least ½ hour before using. In the meantime, prepare your topping ingredients and preheat your oven to 500 degrees. Take the dough and divide it in half. Place the one half back in the bowl and recover. Place some flour onto a working surface and using a rolling pin, roll out the dough to almost paper thin. Start out from the center, working your way out and rotating the dough. Do not worry if you do not have a perfect shape. It will give it a more rustic look. Add flour accordingly so dough does not stick. Drizzle some olive oil onto a rimmed baking sheet and place your dough on the sheet. Cover with your toppings. If you are using basil or arugula, place this after the pizza is removed from the oven so it does not burn. Place in the oven for 5 minutes and then rotate and bake for another 3 minutes. Remove and allow the pizza to cool before slicing.